Schedule for Viva-voce of ARS-2017 Examination Dr. K.K Singh and Dr P.K. Chakrabarty has been joined as Member, ASRB cancellation notice for CCTV Debarment Notice of Sh. Krishna Chitanya K Clarification regarding Notice No. 2(2)/2017-Exam.II dated 25.03.2019 NOTICE - Online CBT for Lower Division Clerk (LDC) at ICAR Headquarters Cancellation of limited tender bearing F.No. 3(6)/2017-GA dated 17th January 2019 Result Sheet of Candidates - ICAR-NET (II)-2018 Examination Submission of OBC Certificate - ARS-2017 Examination Cancellation Notice for AMC Result Sheet - Stenographer Grade-III Examination-2017 Cancellation of E-tender ID No. 2018_DARE_409522_1 regarding conduct of Online CBT Notice for candidates - ARS-2017 Examination Stenographer Grade-III Examination-2017 ICAR-National Eligibility Test (NET-II)-2018 Examination Corrigendum Notice regarding Result of Stenographer Grade-III Examination-2017 ASRB Notice Result Notice and List of recommended candidates - Stenographer Grade-III Examination-2017 Tender for engagement of manpower for clerical services on contract basis-reg. limited tender for AMC of Photocopier machine installed on the Board Open Tender for Operating and Managing of Data Centre at ASRB and Disaster Recovery Centre in IARI, New Delhi - reg. Limited tender for AMC of 01 duplo heavy duty duplicator (Model DP-U850)-reg. 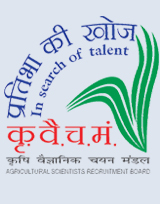 » Notice for withdrawal of 03 posts advertised in Advt. No. 03/2018.